Chain link fences have long been the most durable and dependable fences for both homeowners and commercial property owners. They’re relatively easy to install and provide ample security for keeping pets and children in while keeping intruders out. But what they’ve typically lacked is variety, which is why we’re giving you some tips on how you can enhance your chain link fence. Chain link fences used to typically be sold only in metal colour, but they’ve come a long way and can now be bought in green, black, or other colours. These colours appeal to those looking to have their chain link fence blend in with the rest of the outdoor decor. And if the colour you want is not available, having the fence painted is also a great option. Fence slats come in aluminium, polyethylene, and wood and are a beautiful addition to your chain link fences. They come in a variety of colours and can easily be inserted in any direction on top of your fence. And not only do they look good, but they improve privacy as well. Rolled wood fencing is a good option if you want to cover your entire chain link fence. It can be purchased in bamboo, pine, willow, fern, and twig and is held together by wire. Rolled wood fencing is also useful for privacy because it can stretch up to eight feet. Chain link fences are made of metal and left the same plain colour they’re manufactured in. Whether they’re silver or black, chain link fences can look pretty plain and unattractive when left in their natural state. How to make a chain link fence look nice? One way is to give it a coat or two of paint in the colour of your choice. Some industrial chain link fence contractors in Toronto will even paint it for you, if requested. Chain link fence enhancements are possible with a fun colour to match your house or garden. You can repaint your fence every so often to keep it looking brand new and give your yard an extra flair. The question of how to dress up a chain link fence may seem impossible to answer, but it’s quite easy to create coverage with the help of plants like vines and climbers. The structure of commercial chain link fences in Toronto make them ideal supports for climbing plants. Perennial vines like clematis and honeysuckle bloom beautiful flowers, but if you’re not much of a flower person, you can always opt for a vine like English ivy that’ll mainly provide foliage. Using vines and climbers will cover up your chain link fence, and as they continue to grow your fence may become unrecognizable—which can be a good thing, depending on how fond you are of the aesthetic of your chain link fence. 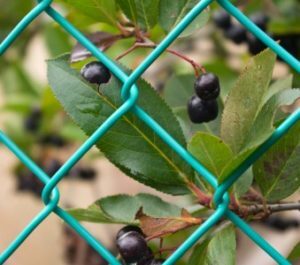 Another way to decorate your chain link fence is to plant one or more fruit trees near it. Many varieties of fruit tress, including semi-dwarf and dwarf assortments, can be trained to grow on fences. You can grow anything including persimmons, nectarines, figs, and apples. The only downside that you may encounter with this option is that you’ll have to prune your tree every now and then to maintain its shape, and to prevent the need for chain link fence repairs in Toronto. To make things easier for you, you can line the bottom of your fruit-laden fence with clump-forming perennials to help control weeds and reduce mowing and trimming. While chain link fences are often industrial and used to establish boundaries, some people may be looking for a degree of privacy or protection from wind as well. Due to their wide gaps, chain link fences aren’t the best choice when it comes to securing some privacy in your yard or protecting it from strong winds—unless you get your Toronto chain link fence contractors to install a privacy or wind screen, that is. Wind and privacy screens can be somewhat of an eyesore, but they do provide users with added convenience. Chain link fences are extremely durable, which is why they’re such a popular option, and with the addition of wind and/or privacy screens, they can be versatile as well. No matter which method you choose to enhance your chain link fencing, it’s best to let a professional do the work. Installing fence slats or rolled wood fencing requires precision in order to get the best visual effect possible and painting a fence can be tedious. Total Fence Inc. offers a multitude of fence installations and related services. Call us now or visit our web site for more information on how we can help you enhance your chain link fence.